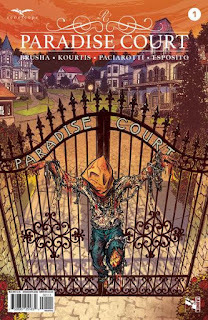 The Fellowship was fortunate enough to obtain a copy of PARADISE COURT #1 from Zenescope Entertainment. Joe Brusha writes, Babisu Kourtis draws, Leonardo Paciarotti colors, and Taylor Esposito letters. Amy and her friends are starting their last Spring Break. They’re making a quick stop on the way to visit Amy’s childhood bestie in her very nice home in the desert. It’s in a gated community, and the residents there are a pretty tight-knit group. Maybe a little too much so, by Amy’s standards. And Amy is the curious type, so when she follows the “weird” neighbor away from the party, she’s also leaving normal behind. This first issue does a really nice job of setting up a slow burn. We get a creepy prelude, then jump right in to setup for Amy and her friends. Everything seems normal, but with little things that are just slightly off. It’s well written and executed, and the art works well at setting up that “almost normal” feel. Zenescope is really knocking it out of the park with these single-arc stories lately. When it comes to horror comics, they’ve still got it after all this time. Paradise Court is a beautiful place, and I can’t wait to find out what’s seething beneath the surface. 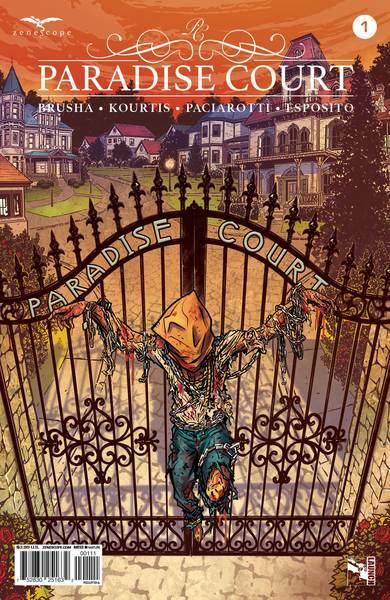 PARADISE COURT #1 is available now from your local comic shop, or online at zenescope.com.